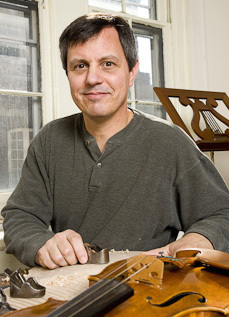 November 15, 2016, 5:14 PM · Violin-making has matured into what many call a "Golden Age" right now in America, but violin maker Christopher Germain can remember a time in his own life when lutherie was an obscure art, and learning it was a mystery. "Growing up, I didn't even know about a program where you could learn to become a violin maker in America," said Germain, 59, a Philadelphia-based luthier who has made some 150 stringed instruments over his career. We spoke in Los Angeles last summer. A native of St. Louis, Missouri, Germain discovered woodworking in his father's basement workshop, a place where time seemed to stand still. "He had saws and planes and scraps of wood, and I would go down there and tinker around. I would practice making things, boxes out of wood -- I could just kind of immerse myself." His Catholic school had no music program, but his high school did have a class that is altogether too rare these days: "Wood Shop." By then, Germain could practically teach the class. He nurtured his love of music by teaching himself folk music on the guitar, then the fiddle. "Probably about the time I was 18 or 19, a light went on, aha - I could make violins!" he said. "But I didn't really know how to pursue that at the time. There was no Internet, believe it or not, so you couldn't just do a search and say, 'How do you learn to make violins?'" It wasn't until about 1980 that he learned about the existence of The Violin Making School of America in Salt Lake City, Utah and the Chicago School of Violin Making, which he ultimately attended. Both schools were quite new on the scene -- neither had even existed until the 1970s. Around the same time (1973), the Violin Society of America (VSA) was established to promote the art and science of making, repairing and preservation. Another professional organization, the American Federation of Violin and Bow Makers, was founded in 1980. But how did we get here? What was going on in American violin-making, before the existence of American schools or professional organizations? It's that history, the fruits of those do-it-yourself American pioneers, that Germain and his colleagues sought to document with an arrestingly beautiful new book called The American Violin, which was just published last summer. The book was a 10-year labor of love, a collaboration between the American Federation of Violin and Bow Makers and the Library of Congress, as well as other contributors. "Back in 2006, when I was the president of the American Federation of Violin and Bow Makers, we were celebrating our 25th anniversary," Germain said. "My idea was to have an historic celebration, where we would meet in Washington, D.C. for an exhibition of historical instruments by American makers. I went to the Library of Congress and met with the head of the Music Division, and they were interested. So we were very fortunate to be able to put on a show which was curated by John Montgomery and Philip Kass, of historic American instruments, which lasted for a month, in 2006. In the initial exhibition there were 30 instruments or so, it was in the Northwest Pavilion. At the same time, we had our annual meeting there, and so we asked all of our members to bring American instruments along with them. We also had Tucker Densley, who did fantastic photography for this book. We accumulated all the instruments at the time, did the photographs." Once they had these gorgeous photographs of some 100 instruments in hand, they realized there was more to do. "We decided, no one has really told the story yet, so we should do that now," Germain said. They formed a 501C3 nonprofit, and things took off. "We went back and did a lot of the research. As often as possible, we attempted to rely on primary documentation. In a lot of literature of stringed instruments and bows, the publications tend to repeat themselves, and they repeat misinformation. So you'll find a number of books which, if you check the facts, they're all incorrect, just because they each took it from each other. So for all the makers, we went to primary documents such as immigration records, birth and death certificates, other ways we could really find out where these people lived, where they came from, when they immigrated." It's a story that parallels the story of America: of immigrants, innovation and starting anew. "This story covers about a 200-year timeline," Germain said. "It starts in about 1750, which is the time we found the first identifiable American violin, and it stops at about 1950 -- we did not attempt to get into contemporary history, the time when people of my generation came along and began studying making here in the United States. We'll leave that to someone else." In the early days, "people who were making or restoring instruments in the United States were either self-taught or they were taught in Europe and emigrated to the United States," Germain said. The very earliest efforts, instruments made in the early 1800s and before, were sometimes rather crude. "There was always a love of music in America, and there was a demand for playing music in the church. But the early makers were oftentimes, say, Yankee craftsmen, people in New England. They weren't professional makers, they were jacks of all trade. They might have made a wheel for a wagon, or done blacksmith work or other crafts, then they thought, 'Well, I've got some tools here, I'll make something that resembles a stringed instrument.' So a lot of the early American instruments are very naive." "Then in the 19th century, America prospered and grew, and the land became settled. There was a demand for music. Cities grew, there was the rise of Industrialism. There were patrons of the arts in major cities, and major symphony orchestras were founded. So there was a growing need for instruments and instrument makers and technicians," Germain said. "In many big cities, the shops would import the talent from Europe. At the same time, people who were trained in Europe moved to the United States for a better way of life, for economic, social, religious reasons. There was a lot of immigration coming from virtually every country in Europe: France, Germany, Italy, Sweden, Norway, Denmark, Great Britain." There are some interesting-looking fiddles from those times that are pictured in this book: take for example the "Mute Violin" made in 1886 by Charles Francis Albert of Philadelphia (pictured right). It was in the collection of William Moennig & Son before being sold to the Boston Museum of Art. What, even, is this? "It just shows, somebody who had unlimited time to make something which was interesting but of limited utility," Germain said. "This is a practice violin. Nowadays, what most people would do is put a heavy practice music over the bridge -- or clothes pin or something! Charles Francis Albert went to the trouble of making this very elaborate, ornate instrument, just for practice. So it didn't produce much sound at all, but it had the look at the feel of a real violin." "It's several boxes and it has little features so you can pull out the pins and raise and lower the bridge," he said. "This was made in that period of the 19th century where everybody was inventing something and everybody had patents." The book describes a group of violin makers from that time, calling them the "American Iconoclasts." "They were not professionally trained makers, but they were interested in many different things," Germain said. For example, "Freelan O. Stanley was a violin maker in Boston, but he was also the inventor of the Stanley Steamer." The Stanley Steamer is a famous early automobile, pre-Henry Ford, and it was a steam-powered car. "There were these types of people who were just interested in making things, patenting ideas, exploring all the opportunities. Another maker was Walter Colton from New York, who was independently wealthy; violin making was just something he loved. So he traveled the world; he got to know J. B. Vuillaume and other makers. He learned, he picked up things from Vuillaume and made a limited number of instruments as a hobby, but at a very high level." "So there were a lot of interesting stories. Stories of how people came to America, where the settled, oftentimes working for larger violin shops, but then they would wind up working for themselves," he said. "Take Carl Becker, one of the American makers that everyone has heard of. That was a father and son business, Becker Jr. and Sr. They were unique in that they were truly American-born and trained, and they worked here. They were influenced by other makers who came from Europe, like Johann Hornsteiner, who had come from Germany to work in Chicago and was one of Carl Becker Sr's early teachers. But the Beckers themselves were born and trained in American and I think would be considered the deans of American violin-making." 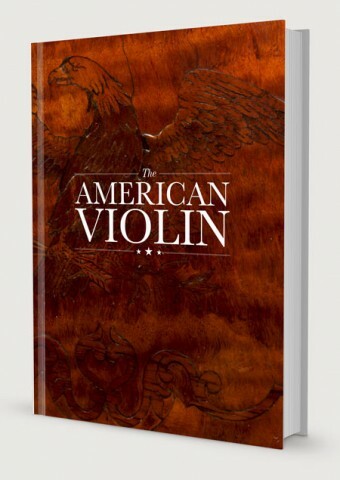 For stringed instrument makers and dealers, books such as The American Violin are a special, bordering-on-secret genre of rare, highly detailed and expensive reference books, used both for authentication as well as inspiration. "When I was a student, there were only maybe three or four books: the Hills published a book on Stradivari, one on Guarneri, you had a very early book published in the late 1970's, Sacconi's The Secrets of Stradivari." Also, Walter Hamma had published a couple of books on Italian and German violin makers. Then in the '80s and '90s, and nowadays, there are many books being published on these subjects and a lot of them tend to be monographs. So you'd see a monograph, just on instruments of Carl Becker. There's a close parallel to books on artists; big glossy books, sometimes it's about just one artist, or a category of art." "They tend to be labors of love, they're not mass-production books, so we only published 700 copies," he said. "This book is important in that it is extremely well-researched, well-documented, well-photographed and well-presented." "It is inspiring to see the work of those who have come before us, to know their stories, where they came from," Germain said. "It's the American story, it's exactly the way our country was founded: people came for a better way of life, either for better economic reasons or political or religious freedom. But this was the land of opportunity and so many of the makers in this book came here for that reason. It was very difficult to pack up your family and move across the world at a time like that; there had to be compelling reasons to do that. Here's that story, condensed around the violin trade." November 16, 2016 at 12:31 AM · That "mute violin" is really cool. I just put in a request to our library (at VT) to add this book to their main collection. November 16, 2016 at 09:51 PM · I wonder if all VSA competition winners are listed ? November 17, 2016 at 05:02 AM · I have not found a place that has all past winners; the link above has the 2014 winners and at the end of this week I'll post winners in the 2016 competition. November 17, 2016 at 10:07 PM · I have a 300 year old violin hand made by Ignatiius Bent, purchased Rochester, ny 1700's . Is he an American maker? It has been verified to be that old.